The metadata portion of the configuration assigns a client to its profile group and to its non-profile groups. The profile group is assigned in Metadata/clients.xml and the non profile group assignments are in Metadata/groups.xml. but this does not explicitly identify that an RPM package version 0.9.2 should be loaded from http://rpm.repo.server/bcfg2-0.9.2-0.1.rpm. The abstract configuration is defined in the xml configuration files for the Base and Bundles plugins. A clients literal configuration is generated by a number of plugins that handle the different configuration entities. A clients Abstract Configuration is the inventory of configuration entities that should be installed on a client. 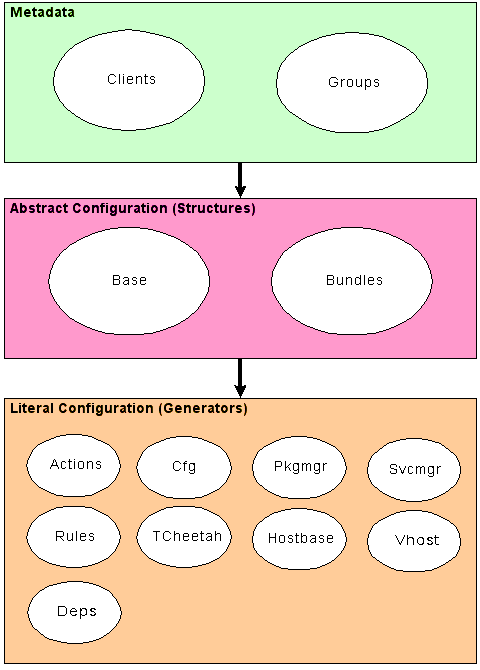 Two plugins provide the basis for the abstract configuration, the Bundler and Base. The plugin Bundler builds descriptions of interrelated configuration entities. These are typically used for the representation of services, or other complex groups of entities. The Base provides a laundry list of configuration entities that need to be installed on hosts. These entities are independent from one another, and can be installed individually without worrying about the impact on other entities. Group membership maybe negated. See “Writing Bundles” for an example. Entities in the abstract configuration (and correspondingly in the literal configuration) can have one of several types. In the abstract configuration, each of these entities only has a tag and the name attribute set. The types of Configuration Entities that maybe assigned to the abstract configuration can be seen at Configuration Entries. An example of each entity type is below. If any of these pieces are installed or updated, all should be rechecked and any associated services should be restarted. Groups can be used inside of bundles to differentiate which entries particular clients will receive. This is useful for the case where entries are named differently across systems; for example, one linux distro may have a package called openssh while another uses the name ssh. Configuration entries nested inside of Group elements only apply to clients who are a member of those groups; multiply nested groups must all apply. Also, groups may be negated; entries included in such groups will only apply to clients who are not a member of said group. When packages in a bundle are verified by the client toolset, the Paths included in the same bundle are taken into consideration. That is, a package will not fail verification from a Bcfg2 perspective if the package verification only failed because of configuration files that are defined in the same bundle. As mentioned above the Configuration Entity Tags may only have the name attribute in Bundle definitions. An abstract group may contain any of the Configuration Entity types and other groups. As mentioned above the Configuration Entity Tags contained in a Base definition may only have the name attribute in Base definitions. A Generator is a Bcfg2 piece of code that is run to generate the literal configuration for a host using a combination of the hosts metadata and abstract configuration. A Generator can take care of a particular configuration element. Any time this element is requested by the client, the server dynamically generates it either by crunching data and creating new information or by reading a file off of disk and passes it down to the client for installation. Details are included on each plugin’s page.